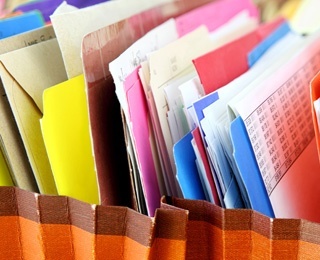 If left unchecked, your folders, file cabinets and boxes stuffed with “important papers” can easily take over valuable space. It’s a common problem for all of us. Since we’re not sure what papers to keep and for how long, we err on the side of caution and hold onto everything from utility bills to monthly bank statements. Tax season is the perfect time to stop and set our records straight. Let’s start with the documents you need to keep for IRS purposes. Unfortunately, the number of years can vary, from 3 years to indefinitely, depending on the action, event or expense of the document. The IRS says taxpayers should keep records until the period of limitations expires to amend a return for a credit or refund, or to be audited by the IRS. That period is typically 3 years after the return was filed. However there are exceptions. For instance, keep records for 7 years if you file a claim for a loss from worthless securities or bad debt deduction, and keep records indefinitely if you file a fraudulent return. Investments (brokerage and mutual fund statements, Forms 1099 and 2439). Birth and death certificates and marriage licenses should be kept forever. Now that you have separated the wheat from the chaff, make sure your personal information does not end up in someone else’s hands.